What is Dee One Property Koh Chang ? 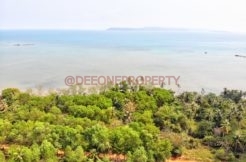 Dee One Property Koh Chang centralizes the real estate offers and demands on Koh Chang island, Trat, Thailand. We offer a full range of quality service to everyone considering an investment on this tropical paradise. Whether you want to buy, sell or rent a property, land or business we are your best choice. We are real Koh Changers. We live in Koh Chang all year long and we have a deep knowledge of this lovely island. You can easily find us on internet and on the field. Listing any kind of real estate here and around for FREE. Advising people who want to settle down here. Please feel free to contact us if you have any questions regarding land and property, administrative tasks, legal matters, building… in Koh Chang or around. You can contact us easily on this website through the “Contact us” tab or using messaging function on our Facebook page, Twitter account or E-mail. You can also reach us by direct call to our office number. We’ve been here for a long time and we’ll do our best to help you to realize your project in here.